"In 1521, the famous explorer Ferdinand Magellan sailed thousands of leagues seeking the legendary spice islands. While the sun-drenched shores of the Philippines were to be his last destination, native spices there were bold and bountiful. There, the Bird's Eye Red Pepper, a small yet robust capsicum, was coveted for its pointed yet delicate heat. Magellan's hosts called the pepper "labuyo". "Centuries have passed since Magellan's journey, yet pepper farmers at the foot of the fiery Mayan Volcano still persist on legend, perfecting the combination of fierce sunlight, fertile soil, and meticulous care to cultivate labuyo to perfection." 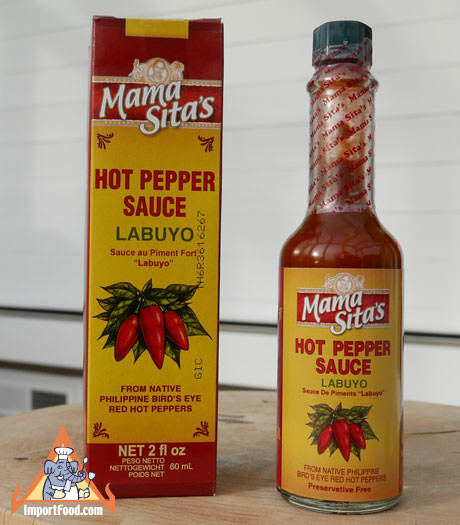 "Down south where labuyo grows wild in the valleys, plains and rainforest fringes, Mama Sitas has planted it's own pepper farm and harvests labuyo at it's prime. Apart from the added vinegar and salt, Labuyo bird's eye red hot peppers reach your table in it's purest form." Packed in a 2 oz glass bottle. All natural, no preservatives. Ingredients: hot peppers, cane vinegar, salt. Product of Philippines.